There are a number of must-do activities when in Fethiye – besides a visit to the ghost town, Kayakoy, you should also take up the boat tours offered by many tour operators especially if you are into sailing trips. 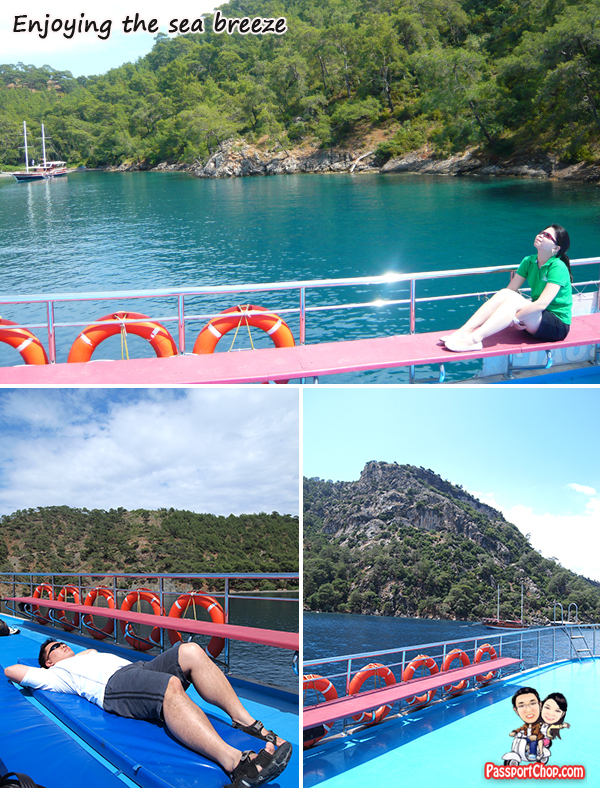 These boat tours are typically for an entire day – you depart at about 9 am and the boat will sail through the coast of Fethiye, stopping at a number of islands for a quick swim or a walk onshore before returning at about 5-6 pm. 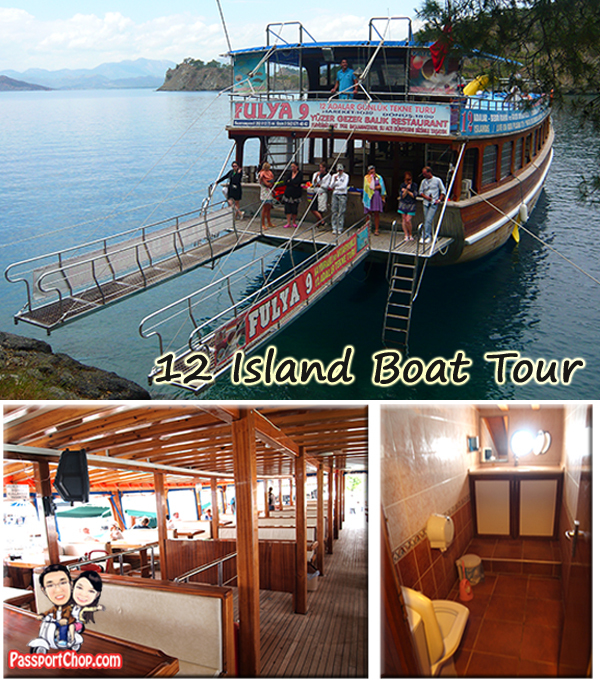 These are called “12 Island Boat Tour” but they typically stop at about 5-6 islands and sail past the rest of the islands. Lunch is usually included in the tour price. The boat facilities are quite ok – the toilet are quite clean and you can choose to spend your time below deck and enjoy the view from your seat or above deck where you can chill out and enjoy a tan. This is a tour where there is pretty nothing much to do except enjoy the scenery of the islands in the Black Sea off the coast of Fethiye. You can choose to be as relaxed as just chilling out on deck enjoying the sea breeze and sleeping off the lazy afternoon. Mats are provided but do your appropriate suntan precaution measures or else you can end up with a terrible sunburn. Lunch is a filling meal of Turkish kebabs – beef or chicken with spaghetti. Quite edible although the bread is a bit stale. Drinks are extra but still quite affordable – the markup is probably 1-2 TL more; very reasonable. You will get constant request from the staff onboard if you would like to buy some drinks or snacks. They could be quite persistent especially since there is only a small group of tourists onboard (about 15+) so do buy something from them – we bought a Magnum ice-cream (reasonable price of about 4 TL – cheaper than in Singapore!) and it was the perfect snack especially under the hot sun. 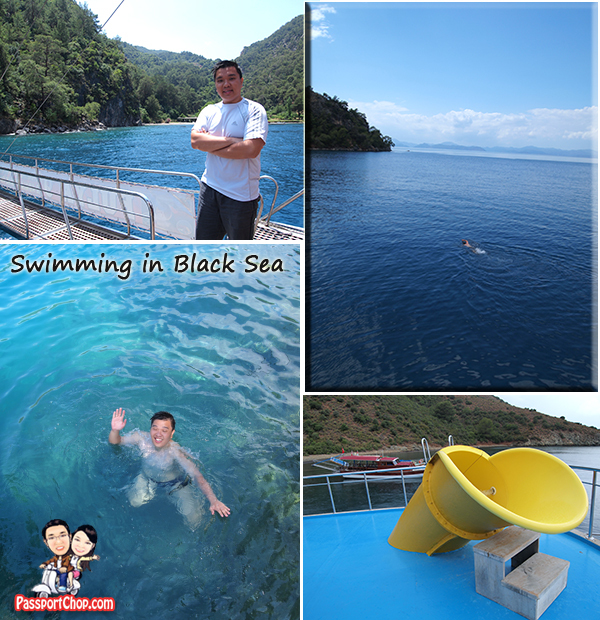 I have left the best part of this boat tour at the last part of my entry here – the onboard water slide. Yes! There is an onboard water slide where you can swish all the way down to the sea from a hole on the side of the boat! It is a very scary experience because once you slide down, there will be complete darkness and it feels like it takes forever to slide down and before you know it, you will end up in the water! There is running water within the slide so don’t worry about abrasions. When going out for a swim – do take note that the boat is parked near the island coastline which means shallow water – watch out for rocks below or you could end up with a nasty scrape. The water can be quite cold as well. When you are back onboard, before you go in the boat, there is a freshwater hose which you can use to clean yourself. Towels are not provided so bring your own! I do love to travel. That looks like so much fun. I am such a fan of heading to the airport. There’s nothing better. Another thing that always amazes me is how much work I can get done when I know I’ll be spending the next 2-3 weeks on vacation. The food is also something I look forward to especially when visiting other places. Funny, now that I’m here in Fethiye I keep seeing signs for the tour and was wondering about then. Timely post! I’m very influenced along with your website as smartly with the structure for your blog. Is this fact the compensated theme or even did you colorize it for you your self? In either case continue the superb high quality composing, it’s unusual to determine a great blog such as this one nowadays.